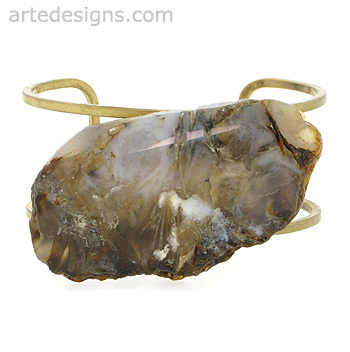 This beautiful organic agate stone is wire wrapped on top of an openwork brass cuff, creating a unique, rustic, and eye-catching bracelet you'll treasure. Agate is one of the oldest stones in recorded history. Agates attract strength. It also protects from stress and energy drains. Brass cuff is about 1 inch wide, agate is approximately 2.25 x 1.25 inches. No two are alike.